Video Locations:Arcade 0:30 Apple 2 2:34 MSX ( Dragonninja ) 3:53 (Direct port of ZX Spectrum) ZX Spectrum ( Dragonninja ) 5:42 Amstrad CPC 7:26 DOS 9:15 Commodore 64 10:44 Nintendo Entertainment System 12:31 Atari ST ( Dragonninja ) 14:20 Amiga ( Dragonninja ) 16:08Description Source:http:en.wikipedia.orgwikiBad_Dudes_Vs._DragonNinjaBad Dudes Vs. DragonNinja, often referred to simply as Bad Dudes, and known in Japan simply as DragonNinja (ドラゴンニンジャ? ), is a 1988 beat 'em up arcade game developed and published by Data East. The game was followed by a 1991 spiritual successor Two Crude (known in Japan as Crude Buster). After Data East became defunct due to their bankruptcy in 2003, G-Mode bought the intellectual rights to the arcade game as well as most other Data East games and licensed them globally.PlotThe game starts in Washington D.C., where President Ronnie (based on U.S. President Ronald Reagan) has been abducted by the nefarious DragonNinja clan. The game's intro begins with the following introduction: "Rampant ninja related crimes these days... Whitehouse is not the exception...". As soon as that occurs, a Secret Service agent asks two street-smart brawlers, the "Bad Dudes" named Blade and Striker: "President Ronnie has been kidnapped by the ninjas. Are you a bad enough dude to rescue Ronnie?". After hearing that, the Bad Dudes pursue the DragonNinja through the New York City streets, a moving big rig truck, a large storm sewer, a forest, a freight train on an old Southern Pacific line, a cave and into an underground factory in order to save President Ronnie.The Japanese and English language versions' endings of the game differ. In the English version, after the Bad Dudes defeat the DragonNinja, they celebrate by eating burgers with President Ronnie. At the very end, President Ronnie is seen holding a burger while standing between the Bad Dudes. Behind them are many security guards with the White House behind them. In the Japanese version, President Ronnie gave the Bad Dudes a statue of them as a tribute to them. The Bad Dudes are seen leaning against a fence on a sidewalk next to their statue. Unlike the ending of the international version, the Japanese version's ending shows a list of nearly every enemy in the game with their names (except the unnamed green ninja boss that multiplies himself), while some faces appear next to the names of the game's staff. The background music played in both versions' endings are also completely different.Game PlayThe gameplay are roughly similar to the 1985 Konami arcade game Rush'n Attack, but featuring up to two players at once. Player One controlling Blade (in white pants) and Player Two controlling Striker (in green pants) will start with nothing but the ability to do punches, kicks and jumps. Some moves are special like spinning kicks and the ability to charge themselves up to throw a powerful, but short-ranged punch toward opponents (of note, most enemies can be beaten with only a single hit of any kind). Players will also come across several power-ups: some are weapons (knives and nunchakus) and some recharge a player's health, and yet others add a few seconds to the remaining time.The various types of enemies encountered in the game have their own means of attack. The basic blue-colored ninja directly charge the player, while some leap with their swords, or throw shuriken and makibishi; there are also acrobatic kunoichi female ninja, attack dogs and even people who are on fire. The enemies may be beaten down or avoided. At the end of each level, one of the "super warrior" bosses will appear which needs to be defeated to progress to the next level. The first of them is Karnov, who cameos from the Data East game of the same name; the background music during the fight with him is similar to the main theme in Karnov as well. Each boss has their own special attacks: Karnov, for example, can breathe fire at the player. 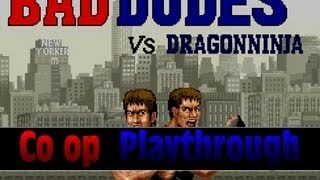 At the successful completion of each level, the dude(s) strike a "bad" pose and proclaim, "I'm bad!". Co-Op Arcade games which have stood the test of time! Pugman and Chippants rate, review and discuss their top 5 Arcade Co-op games which they have played throughout 2013 and feel are still enjoyable and playable today in 2014. WATCH IN HD 720Full Screen for best quality.Twitter ► https:twitter.compugmanplays Facebook ►https:www.facebook.compugman.playsPlease Subscribe, Share, Like and Comment. Your Support is appreciated.!!!! !___ Spoilers Alert below ___!!!! If you are in a hurry to know scroll down, but better yet, watch the video! :) .... .. . . ..... .. . . .Chippants: 5. The Simpsons 4. Alien Storm 3. Cadillacs and Dinosaurs 2. Aliens 1. Rolling Thunder 2Pugman:5. The Simpsons 4. Aliens 3. Dungeons and Dragons Tower of Doom 2. Paperboy 1. Rolling Thunder 2All trademarks and copyrights belong to their respective owners. All videos fall under the fair use policy of copyright. Pugman and Chippants fight their way through the original classic dungeon crawler, Gaunlet.WATCH IN HD 720Full Screen for best quality.Twitter ► https:twitter.compugmanplays Facebook ►https:www.facebook.compugman.playsPlease Subscribe, Share, Like and Comment. Your Support is appreciated.All trademarks and copyrights belong to their respective owners. All videos fall under the fair use policy of copyright.